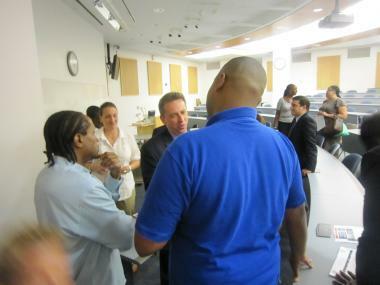 Lt. Kevin O'Connor, assistant commissioner of the Juvenile Justice Division of the NYPD, speaks with Stephen Johnson of the Harlem Youth Marines. O'Connor told community groups that work with youth that the youth crews are becoming more sophisticated. HARLEM — Youth gangs are becoming more sophisticated across the city, finding new ways to identify themselves, working with older criminals who use them to keep cops distracted and recruiting new members in grade school or younger, an NYPD officer in charge of keeping tabs on them said Monday. Lt. Kevin O'Connor, assistant commissioner of the Juvenile Justice Division of the NYPD, told community leaders and parents that police have identified 315 youth crews across the five boroughs. In Manhattan, there are more than 50 youth crews, including at least 35 in northern Manhattan. The groups are increasingly recruiting kids in middle school or younger — leading to school backpacks marked up with gang affiliations and feverish activity on social media like Facebook and Twitter. As opposed to identifying themselves with just colors, kids are now drawing all over their backpacks with the name of their gang and using bracelets and tattoos to identify themselves. Social media is increasingly being used to taunt rival crews. O'Connor showed pictures that crews had posted to Facebook of them posing in their rival's territory. One crew in the Bronx created a T-shirt that named themselves as the killer of a rival crew member. "Why not put a bull's-eye on the back of your head?" O'Connor said. And it's not just neighboring crews that are rivals. The groups are forming alliances with crews from other parts of their neighborhood or even different boroughs. He said beefs between the groups are often sparked by thefts of expensive sneakers, coats, iPhones or headphones. "It's not just one group versus another anymore, it's multiple groups," he said. Crews in Upper Manhattan and across the city have been growing more organized and more violent, as older and more experienced criminals organize some of the crews as a way to create a sense of havoc, keeping police occupied elsewhere so that they can sell drugs. "The older guys are keeping the younger ones around because it creates an atmosphere of violence," said O'Connor. "They are using the young people to divert police attention." The crews, which also include subsets and female crews, align themselves according to neighborhood territories and sometimes just brawl or hang out in large groups, he said. Meanwhile, importing high-powered guns from places like Virginia, where it is easier to buy firearms and selling them for marked profits, is becoming even more commonplace. Some of the crews even advertise on the Internet where they get the guns. "They pay $500 for a gun and they sell it for $2,000. It's a simple way to make money," said O'Connor. "They have access to guns that will go through my bulletproof vest like a piece of paper." The guns and rivalries lead to shootings like that of Ackeem Green, 25, who was killed on June 3 on a basketball court on Seventh Avenue and 129th Street. Police believe Green was not the intended target in what may have been a rivalry between two Harlem crews. "They think it's a game," said O'Connor. "We are dealing with a kid mentality." Manhattan District Attorney Cy Vance's office has gone after some of these crews. Fifteen people from the alleged 129th Street crew known as "GoodFellas" have been convicted or pleaded guilty to conspiracy or gun charges. Vance said the crew was importing and selling high-powered weapons in Harlem. Fourteen members of the 137th Street crew have been convicted on gun and drug charges. The crew, like many youth crews, used girls, such as former prep student Afrika Owes, to carry weapons. While those prosecutions help to reduce shootings, law enforcement alone is never enough, O'Connor said. That's why the NYPD is engaging community groups and parents in the hopes of tackling the problem. "These kids want to know that we know about this," O'Connor said. In the next few months, O'Connor said he'll be speaking to community-based organizations and parents in other boroughs. "I want to do more. I want to get everyone in the game," said O'Connor. "We need you to outnumber these kids 10 to 1." Robin Holmes, project director for Operation SNUG, which uses ex-gang members to prevent violence, said spreading the news to the public about what's going on is important. "People need to understand what's happening because this will continue to evolve if we don't put a stop to it," Holmes said. Holmes said there have been cases she's been involved with where a teen has been shot and the parent was unaware their child was involved in gang activity until they came to the hospital. "It's a matter of being focused, getting involved and being aware of what your child is doing. You've got to pay attention," Holmes said. Kimberly Watkins, a Harlem resident and fitness instructor, called the session informative. She said it also increased her resolve to hire young people as fitness instructors in a program she is putting together. "These are the kids I want to hire so they have other options than drugs and guns," she said. Stephen Johnson of the Harlem Youth Marines said providing alternatives is an important part of the solution. "The whole idea is to get them involved in something positive as opposed to the crew lifestyle," said Johnson. "It has to be about the community, the village stepping up to raise a child."